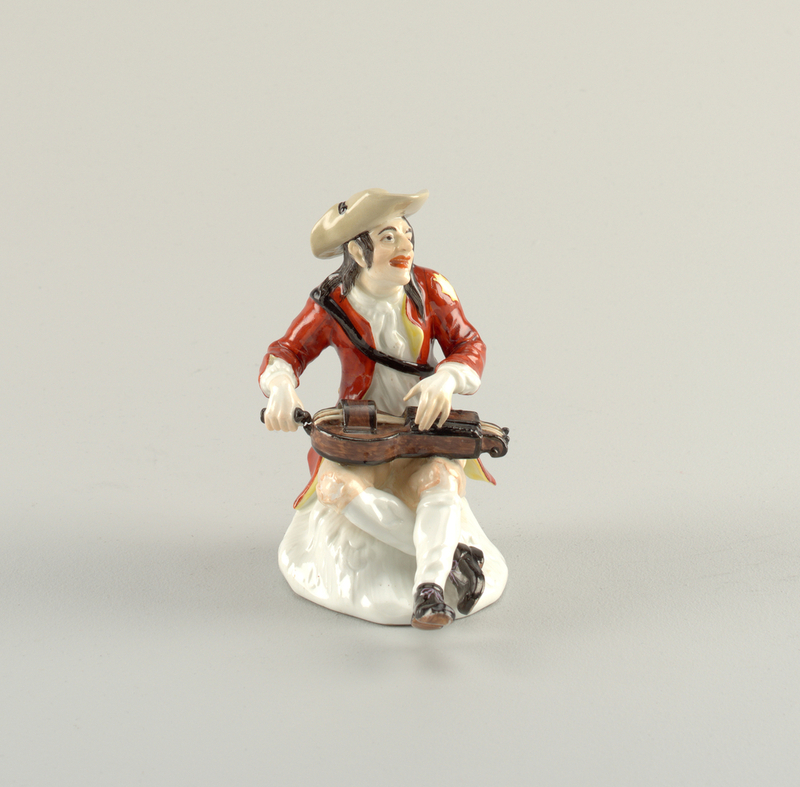 At first glance, this porcelain figure is an ordinary jovial musician. He may even seem well dressed, with his bright red jacket and white cravat knotted at the neck. But a closer look exposes the torn breeches, ripped shoulder and scraggly hair. The last point drives home that this is no gentleman. During the eighteenth century, a curled, powdered and scented wig made of human hair was one of the most visible expressions of affluence and was the source of great pride and vanity among men. The musician’s straight, dark locks drooping around his shoulders signal his impoverishment as much as his tattered clothing. Across his lap is a hurdy-gurdy, a stringed instrument with a wooden wheel which acts as a bow when turned with a crank, and a keyboard with rows of small wooden pegs which are pressed against the interior strings to modify their pitch and produce a melody. A second set of strings sounds a steady droning noise similar to that of Scottish bagpipes. The instrument’s name may be derived from the Scottish word “hurly-burly”, defined as “commotion, tumult, strife or uproar”— all a rather accurate description of the cacophonous music produced when a hurdy-gurdy falls into unskilled hands. In the medieval period, the predecessor of the hurdy-gurdy was popular with wandering minstrels and could be heard at court, village dances and church processions. But as musical tastes shifted, the instrument fell out of favor and gradually came to be associated with peasants and blind beggars. In Germany the instrument was referred to as the Bettlerleier (beggar’s lyre). The pitiful hurdy-gurdy player became a stock character for European printmakers. An etching produced in France around 1610 shows a musician with a hurdy-gurdy violently attacking a terrified pilgrim. Yet in the eighteenth century the hurdy-gurdy player began to appear in the unlikeliest of places— the dining rooms of Europe’s elite. At this time, it was fashionable to arrange the dessert table with a tableau of porcelain figures designed to amuse diners. Musicians, dancers, shepherds, peasants and comic actors were all perennial favorites. With this cast of characters, our hurdy-gurdy man would have been in spirited company. Rebekah Pollock is a design historian specializing in eighteenth-century print culture and European ceramics. She has a Masters in the History of Decorative Arts and Design from Parsons The New School for Design / Cooper Hewitt, Smithsonian Design Museum, New York.